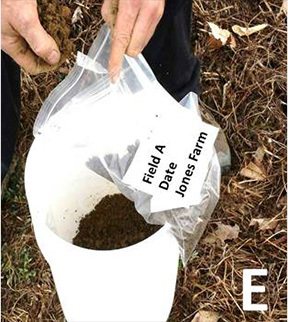 For a more complete description of sampling guidelines, including how to choose representative sub-sample locations see the soil sampling protocol section of the Comprehensive Assessment of Soil Health – The Cornell Framework Manual. Identify 10 locations within the area you would like to test that are representative of the field or plot. A – Remove surface debris. 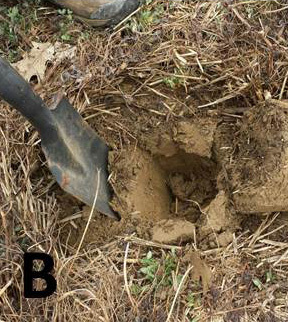 B– Use a spade to dig a small hole about 8” deep. From the side of the hole take a vertical slice of soil 6” deep and about 2” thick. 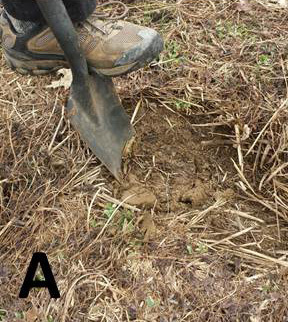 Collect the same amount of soil from all soil depths so the sample is not biased with more soil from the top compared to the bottom. 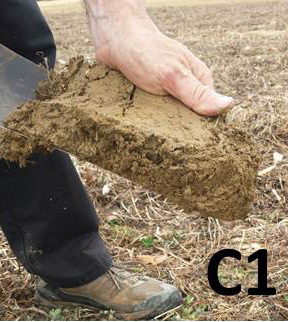 C1 and C2 – Manually remove any extra soil to ensure an even 6” x 2” slice of soil. Place into clean pail. D – At each sub-sample location collect soil hardness information with a penetrometer. 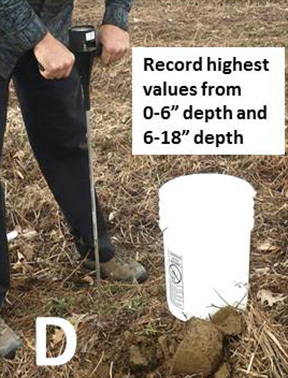 Record maximum hardness from the 0-6” and the 6-18” depth on the Submission Form. 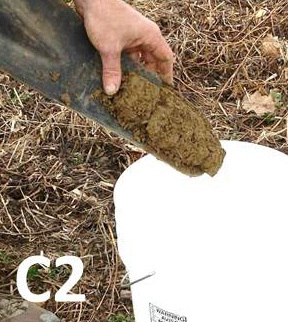 E – Repeat steps A – C to collect the remainder of the sub-samples. Mix thoroughly and place 3-6 full cups of soil (one quart) into a clearly labeled Ziploc bag. Keep cool. Submit soil sample and submission form promptly.